Abu Garcia deliberately overbuilt their high-performing Soron STX Spinning Reels to give anglers a big-time strength advantage. Soron STX Spinning Reel feature Abu Garcia's exclusive SuperLine spool system which eliminates the need for backing or tape when using braided line. The lightweight Soron STX Reel’s body, body cover, rotor and bail arm are built with Abu Garcia's X-Craftic aluminum alloy to deliver unbeatable durability and corrosion-resistance. The Soron STX's 10+1 HPCR bearings with Instant Anti-Reverse and sealed Carbon Matrix drag system combine to deliver ultra-smooth consistent performance. Everything about the Soron STX is built tough and rugged, form its stainless steel main shaft and hardware to the Duragear gears and Everlast bail system. Includes spare mono aluminum spool. "This reel is bullet proof and quality made. There is no plastic, the handle cover and anti-reverse knob are also made of metal. It cast well with either mono or braid and the braided line spool works excellent." 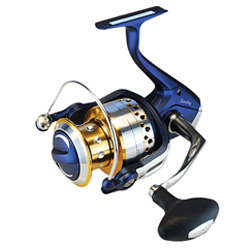 ""I have used the Soron STX10 and it is a smoking hot reel. Its smooth as silk and cast a mile. The carbon matrix drag is unmatched,I used it Hybrid striped bass fishing and it handled their runs easily." "This new reel is a very good reel. I have the STX20 which is set up for 8lb test braided line, BPS didnt have *LB on the shelf so i spooled it up with 10lb. This reel and my new ST Croix rod (5'10) cast a pretty long distance."